Two Yorkshire-based manufacturers with a strong track record in exporting are speaking out on the importance of the EU for jobs and growth in the region. ElringKlinger based in Redcar and Naylor Industries in Barnsley are taking part in a drive by EEF, the manufacturers’ organisation, to explain why being in the EU is important for British manufacturers. It follows independent research showing that over six in ten EEF members (61%) are in favour of the UK remaining in the EU, while just 5% support a ‘Brexit’¹. ElringKlinger is a worldwide development partner and supplier of technical components to major, global vehicle and engine manufacturers. 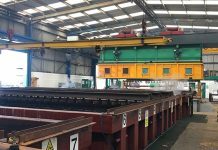 It is part of an international group and employs a 230-strong workforce at its site in Redcar. Naylor Industries is a Barnsley-based manufacturer with a 125 year history. The company’s pipes and other construction products are exported to Europe and further afield and overseas sales have tripled over the past four years. It employs almost 400 staff and has had its export success publicly recognised, winning awards and also featuring in a special national report published for the launch of Exporting is GREAT – the Government’s biggest ever export campaign. This experience makes both firms well-placed to explain the importance of the EU to their ongoing growth and productivity and to demonstrate the critical link to jobs and contracts in the region. The pair will be featured on EEF’s national website where they will talk about the positive impact the EU has had on their companies. The referendum is in my humble opinion the most bizarre and non-productive thing the UK government has committed to. My biggest concern is that this referendum will not be decided on the facts. For example while the actual values of UK and EU exports are banded around, the facts are that almost half of UK exports go to the EU whilst only 10% of EU exports come to the UK. This demonstrates the importance of this market to the UK. We sell our Drainage products right across Europe as well as sourcing materials from France and equipment from Italy and Germany. As part of the EU, such transactions are simplicity itself. A Brexit ‎would introduce a most unwelcome uncertainty and would almost inevitably increase the complexity of trade within Europe. According to the survey, 70% of EEF members say that remaining in the EU is important (50%) or business critical (20%) for their company². At the same time it points to companies like Leeds Test Objects weighing up the pros and cons of EU membership and taking a pragmatic view. These manufacturers, like many others, are dynamic exporters and as such are proudly flying the British flag. We think this gives them an interesting and insightful business perspective on the EU that they deserve for people to hear. With the vote on our future in the EU around the corner, it’s important that the potential impact on local firms is taken into account. The full case study feature can be seen here. ²In response to: ‘How important or otherwise is it to your company that the UK remains in the EU?’ This was asked of all respondents.